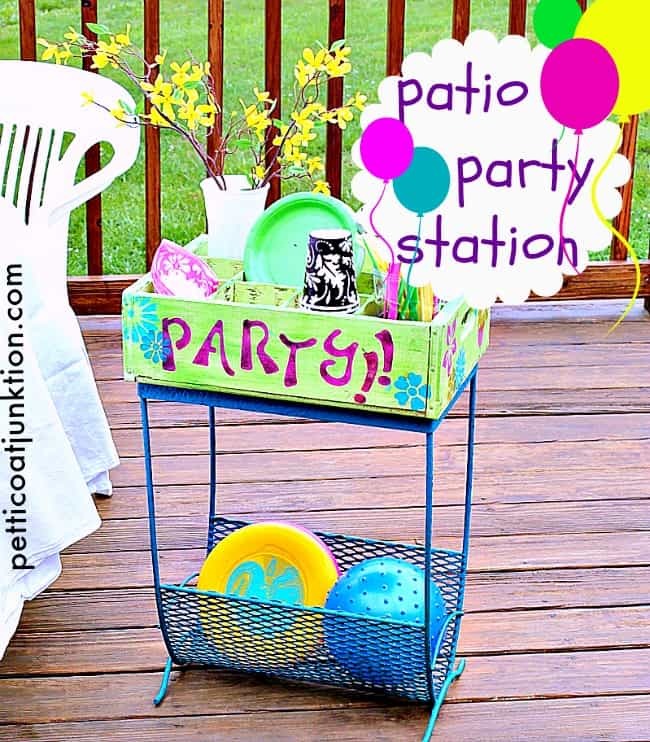 The patio party station idea started out with these two reclaimed pieces. I wanted to join them together without too much fuss…..but wasn’t sure how. When I was asked to create a project using Elmer’s Probond Advanced I was really excited! I use Elmer’s products in the workshop but haven’t had a chance to try the Probond until now. 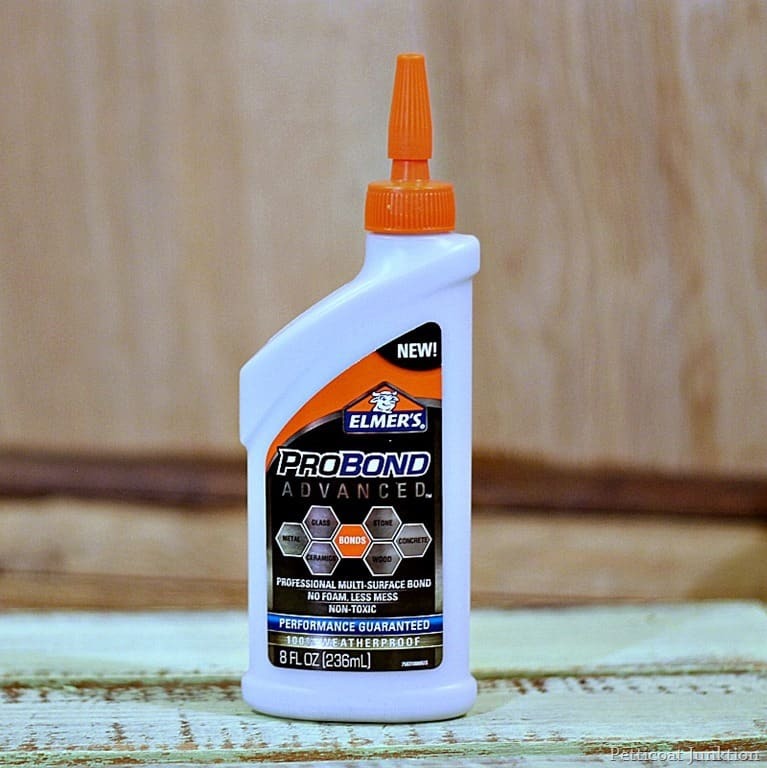 ProBond Advanced is Elmer’s strongest and safest multi-surface glue that is able to provide strength, durability, and ease of use with a clean finished appearance. It has the ability to bond mixed materials such as wood to metal, glass to concrete, or ceramic to drywall. I used a spray primer and spray paint on the rusty iron table base. 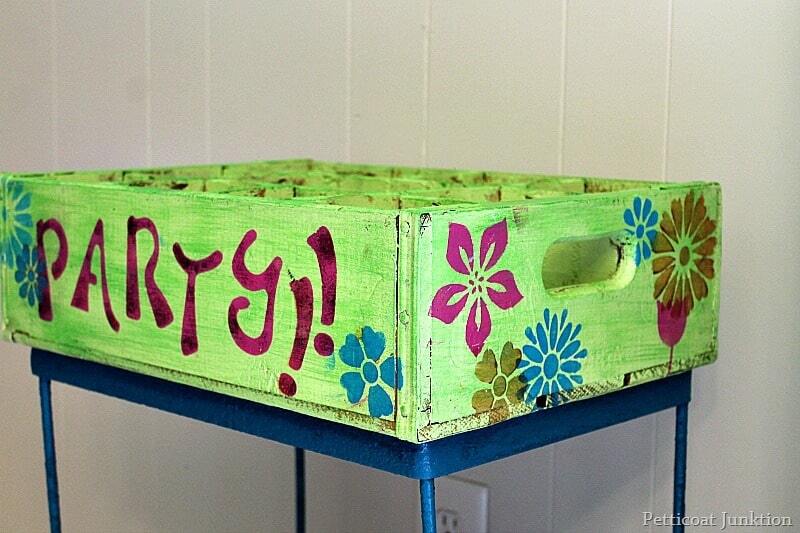 While the table base was drying I painted and stenciled the crate. 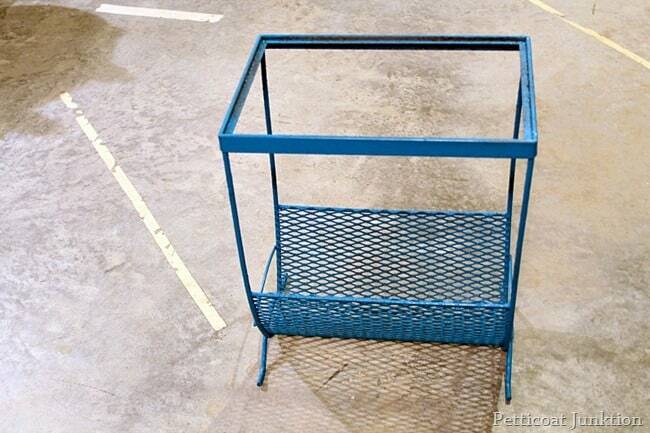 I applied the ProBond to the top of the iron base and set it on the crate. 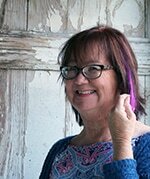 Then I applied a little more around the outer edges. Probond dries clear and doesn’t have that yucky foam residue. 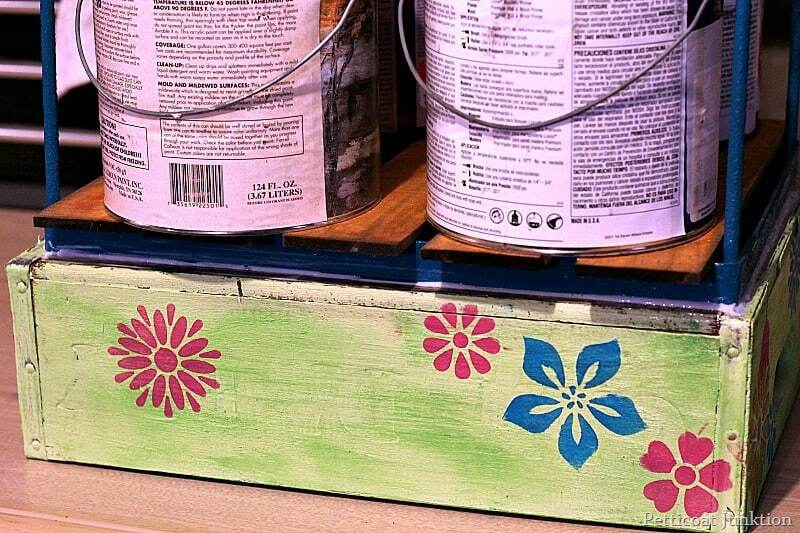 Instead of trying to clamp the two pieces I placed boards and 4 heavy gallons of paint on the upside down table base. I set the table inside while getting the party supplies together. I stenciled all sides of the crate. The bright colors just scream Summer. I decked out the station with supplies for the kids. 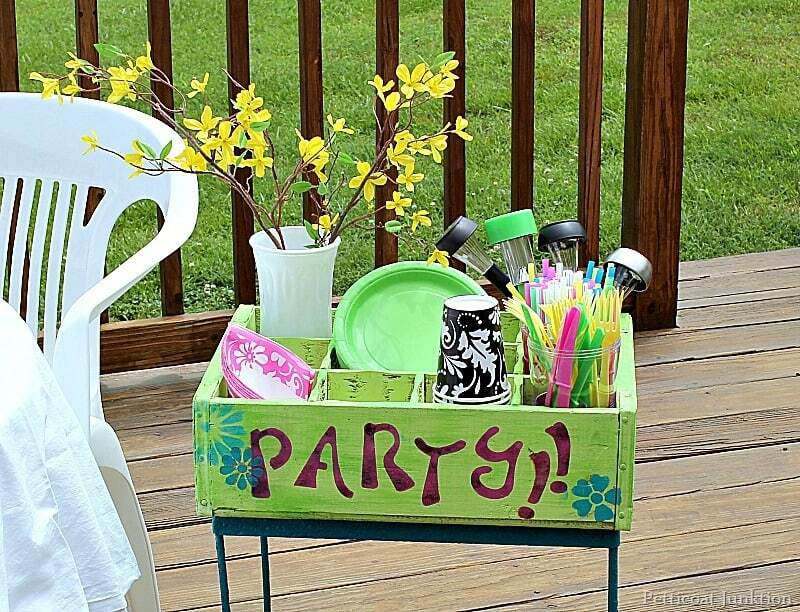 When we have the grandchildren over it’s handy to have everything together for lunch and outdoor activities. The server station would be great as a beverage server, side table, you name it. 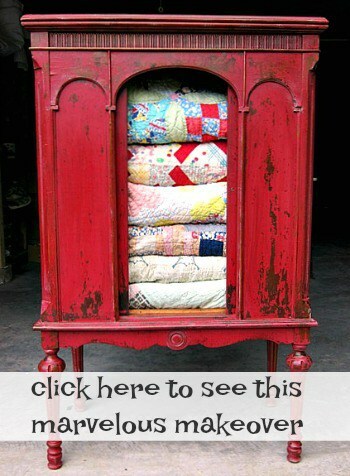 Check out the Elmer’s Mixed Materials Pinterest board for more project ideas. Maybe you have a project in mind? What do you thing of my party station? So adorable! The whole idea is genius and I love the colors you chose! Absolutely adorable!! I love it!! Now that’s a super duper party station if I ever saw one, the colors are perfect for summer or anytime really. I love bright happy colors. Just looking at them can make a person smile, think you accomplished that and I’m not only one. 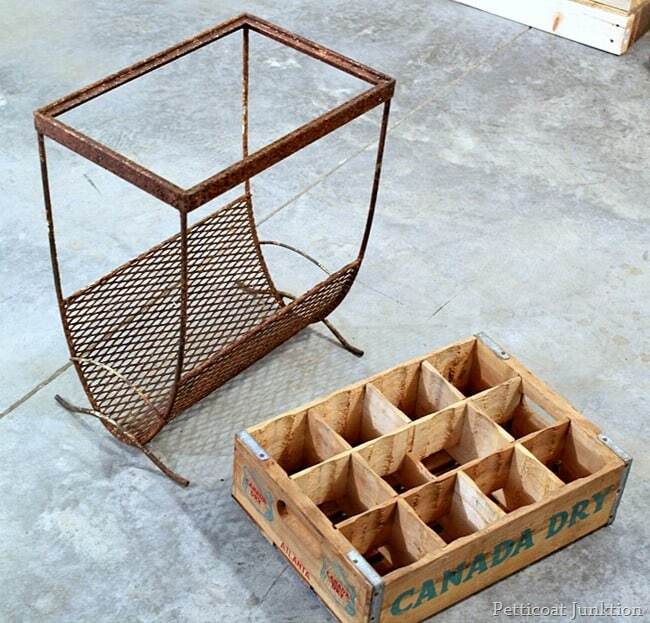 The crate and metal table with place below to corral tablecloth or whatever it’s needed for. 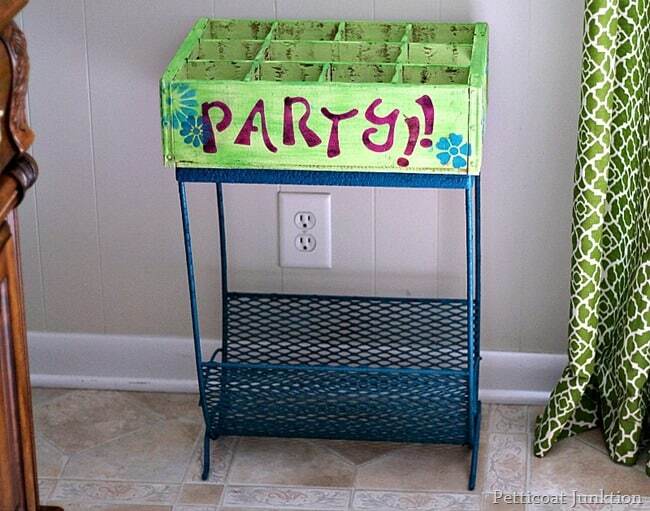 Wish I could find something like that to put beside the couch or our small kitchen island to keep some of my crafting goodies out of the way. Too often they’re on end of kitchen counter. Love this, what a creative idea! Love your unique party station and know that you’ll enjoy using it with the grandchildren this summer. I need to look for Elmer’s Pro Bond the next time I am shopping. That is some mega glue!! Love your little party station Kathy! It really does hold that table together. I love this project too. Thanks Nancy! Older than dirt here too! Yeah, I remember using Elmer’s paste in grade school. It came in a can with a little spatula. 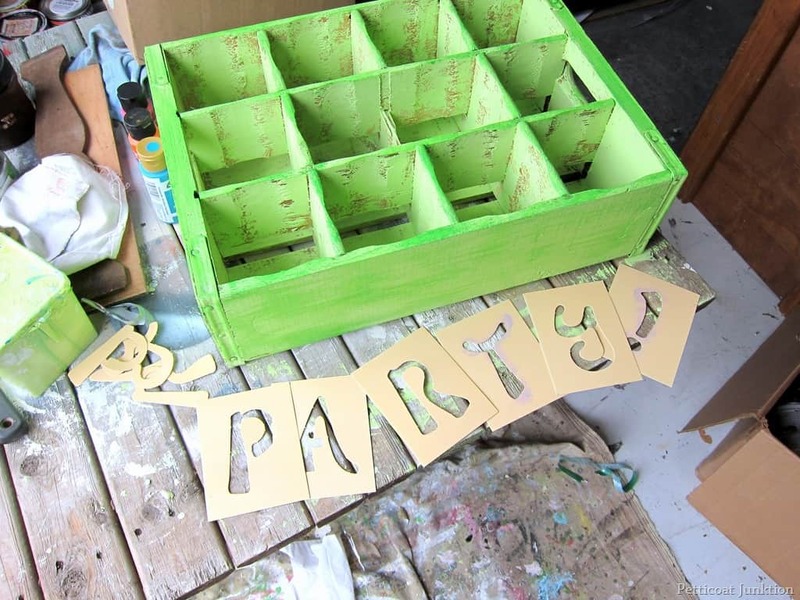 Your new party station is ideal for any gathering. I like how the glue is so strong and perfect for metal and wood. Thanks Meegan. I was amazed at how well the ProBond worked. I can pick that station up by the crate handles and tote it anywhere! !